I saw a guy on the street wearing a pair of those shoes this week. I say I saw him, I heard him first obviously. 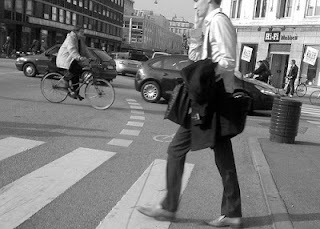 He was dressed very sharpish and cool and when he ran across the road in between the cars I could tell that he had a pair of those shoes on. Well you can, can’t you? It’s hard not to. Seeing/hearing him took me right back to when I was a boy. I didn’t care anything for clothes or fashion. About the only thing I craved, in that regard, was a jacket with an inside pocket. I wrote about that here if you're bothered. That inside pocket thing wasn’t even about fashion considerations anyway. It was about practical matters such as being able to reach in and pull out important documentation at key moments, like they did in the movies. It was also necessary as a place to keep my toy gun. Up until the other day, I would have said that the inside pocket was the only childhood interest I had in matters of Couture. This guy reminded me though. He reminded my of those shoes. Those shoes… man, I craved a pair of those shoes. All the cool guys had them when I was young and there was no doubt in my mind that the having of them made the cool guys ever cooler and thus might have made me even a little bit cool if I could only have gotten a pair. I asked if I could please-please-please have some but I was told that I couldn’t, I was far too young for that kind of thing. You know the shoes I mean, don’t you? Of course, it wasn’t the shoes per se. It could have been pretty much any pair of shoes, I reckon. It was what you did to them to make them do that Thing. That Thing. To make That Noise… That’s what I craved. That clippy-cloppy noise that the cool dudes all made as they Tony Manero’ed themselves around town of a Saturday afternoon. I only discovered when I got a bit older that it wasn’t the shoes that made the noise at all, it was the attachments you put on to the underside of them. I don’t know what the world calls them now but we used to call them ‘Tips’. They were steel inserts that were beaten into the soles of your shoes. They were ostensibly employed to protect and add longevity to the footwear but, sod that, nobody believed that crap for an instant. It was all about the Cool. The glorious racket you made wherever you walked. The unbelievably toughness of you. There was a technique too. Do you remember that? The coolest users of the tips didn’t just settle for a regular ‘clip clop’ down the thoroughfare. Hell no. Every seventh or eight step – a bit like those waves off Devil’s Island in 'Papillon' – these guys would pull off something remarkable. A scrape. Somehow they would effect to drag one or another of their tips along the hard pavement and thus intersperse their marvelous gait with a soul-destroying scratch across the surface of the universe. It was as cool as all-be-damned. But I won’t, will I? My moment for tips has gone. I wouldn’t want to draw attention to myself on the street anymore. I really only want to slink past people and into the bakery for a bun. I am silent and I cling to the shadows. Noise is now for other people to do. There are some things in this life I might be willing to confess that I’ve aspired to (or even just dreamed about) but being cool was never one of them. To this day my one goal when it comes to clothes is not to look like a tube. When I was at school that meant looking like everyone else as much as I could get away with. There was a short-lived fashion in the early seventies for jeans with huge turn-ups. For some reason they were called ‘skinners’—I have no idea why—and I wanted a pair. And I got a pair too—yay me—but here’s the catch: I needed someone to sort out the turn-up for me and that was my dad who did all the alterations in our house because he was the only person who could work the sewing machine but that was his own fault. Dad had his own ideas how big turn-ups should be and so that’s what I got, about an inch and BOY did I feel like a tube in them. I really am though the last person you’d ever describe as a fashionista but I do know where you’re coming from with those shoes and that sound. Some of the kids I knew had segs on their shoes. I don’t recall anyone having toe plates though. I did once get a pair of metal corners on the heels of a pair of shoes but found I didn’t enjoy walking in them afterwards. The sound was fine but the feel wasn’t. I kept thinking I’d slip.